After a fall season full of innovative and original new fantasies for children comes a fairy tale retelling that is both original AND traditional. The Princess Curse retells the traditional story The Twelve Dancing Princesses, but with a twist. The first wave of fairy tale retelling novels were pretty straight-forward: merely novel-length retellings of the fairy tale. The second wave contained heroines that were more strong and opinionated, but they often seemed all of a type — just modern women dropped into medieval settings with all their anachronistic ideas intact. The authors took pains to point out that their main characters weren’t “just” princesses, but they never gave us any examples of what else they were. Reveka, of The Princess Curse, on the other hand, is very clear about who she is and what she wants. She was raised in a convent (while her father, a soldier, was fighting in various wars), and is now an herbalist’s apprentice. What she wants more than anything is to be an herbalist herself and to have her own herbary in a convent. Her needs and desires — and considerable skills! — tie directly into the action of the plot, and is the catalyst for several major revelations in this well-told story. In addition to a compelling and believeable protagonist, Haskell gives us a very specific setting. The story is set in Sylvania, a fiction region of the real country Romania, and mentions Hungary and Transylvania. Many of the fantasy elements are derived from the Romanian language and folklore, and are worked into the dialogue and description seamlessly. We all think we know the story of the Twelve Dancing Princesses, but really: what’s life like in the castle for those who aren’t royalty? How are the countries surrounding their kingdom reacting to the problem? How did the princesses end up in that magical predicament anyway? And who precisely is it that placed them under that enchantment? What does that mysterious person really want, and why? Reveka’s journey through her own story will give readers the answers to all these questions. About a month ago, Seattle librarian and book maven, Nancy Pearl, had a brief spot on NPT talking about her “most memorable characters” of 2011. 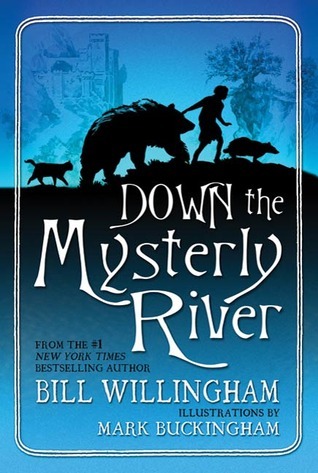 She had high praise for Max “the Wolf,” Willingham’s main character in Down the Mysterly River. I beg to differ. Oh, Max was alright, but I found him a bit of a whiner and maybe too much of a “Boy Scout.” Actually he was a Boy Scout and proud of it. Don’t get me wrong, I have a long and happy history with both the Cub and Boy Scouts, but, really, I’ve never met a 6th grade boy as upstanding as Max. For me, he just didn’t ring true. I did however, really enjoy the book. It’s a great adventure, full of tension, excitement, mystery humore and surprises. It has heart, especially because of the three secondary characters. One of the biggest surprises for me was how involved I became with Banderbrock the warrior badger, McTavish the cantankerous barn cat and especially the amiable, slow-witted but fiercely loyal “sheriff” bear, Walden. After a somewhat slow and confusing beginning, I found myself keenly interested in solving the mystery of exactly where—and why—the friends found themselves. What had they done to deserve the wrath of the malicious “Blue Cutters” who hounded them so relentlessly, and would they ever see their homes again? Thanks to Willingham’s forte as a storyteller, all becomes clear. There seems to actually be a possibility for a sequel. I’d be interested to see—and read–that. This month Kelly talks about a new favorite, The House Baba Built by Ed Young. Maks is a “newsie” in New York City in 1893. He is selling The World. His parents are Danish immigrants and his family is struggling to make ends meet. Every penny counts. One day Maks is cornered in an alley by a gang of teenagers who are trying to drive off the newsies. Maks decides to fight but is losing when suddenly a shapeless pile of rags becomes an attack force with a stick. When the attack is over, the gang members have been run off and Maks realizes that the person who saved him is a skinny, smelly, raggedly dressed, homeless girl. He decides to take her home for the protection she can give him and also to repay her with a meal. The same day he brings Willa home, he finds out that his oldest sister who works as a maid at the Waldorf has been accused of theft and is in the prison called the Tombs. Thus begins an adventure for the homeless girl and the newsie. They find an odd and ailing detective who has Maks do his investigating for him at the Waldorf. In the process, Maks discovers some clues and also learns something about Willa’s family. This is an exciting story and a good historical description of life in New York City for immigrant families living in the tenements. Recommended for children in grades 5 and up. One of my son’s new favorite books is Tip Tip Dig Dig by Garcia. Each page of this story features a truck in action working away on a mess. Little ones can see the digger dig and the roller roll. What can they do when they all work together? They can make a playground! And while it may be too cold to play at the playground right now, it sure is fun to watch one being made. The big, bold illustrations and simple text make this a great toddler read aloud. Little ones can even join in with the actions. A late 2011 release, I think Pie by Sarah Weeks may have squeaked in as my favorite book of 2011. Generally being a fan of both action and angst in my reading choices, I often lose interest in books with recipes, books that have exceedingly happy endings or books that feature unbelievably nice characters, but somehow this book contained all of those elements and managed to keep me enthralled. Pie takes place in the small town of Ipswitch, Pennsylvania in the 1950’s. The story opens with the death of Ipswitch’s most famous resident, Polly Portman. Polly is famous because of her extraordinary pies that have earned her 13 coveted Blueberry Awards, a national award. This coupled with the fact that Polly gives the pies away for free brings people from all over the country to the small town. When Polly Portman dies suddenly, the entire town is left trying to figure out how to live without her famous pies. To make matters worse, Polly has left meticulous notes on how to make her pie fillings, but not her delicious pie crust. To everyone’s dismay, the pie crust recipe has been left to Polly’s cat, Lardo. Polly’s beloved niece, Alice, inherits fat, cantankerous Lardo and is therefore thrust into the spotlight as people from miles around try to hunt down Polly’s famous pie crust recipe. The recipe is so sought after that Lardo is kidnapped from Alice’s house and Alice and her friend Charlie must start an investigation of all of the town’s people to retrieve Lardo. This book is filled with charm. The language Sarah Weeks uses to describe Ipswitch and its inhabitants is delightful. Scattered throughout the book are Alice’s original songs which sound like 1950’s advertising jingles. Finally, recipes for Polly’s pies open each chapter and are sure to inspire many bakers to try making them. Just in the nick of time comes a new mystery series that is lots of fun for young readers. The main characters are a boy named Milo and a girl named Jazz, and they are friends that like to solve mysteries together. Not a new concept, but it’s fun to have a new series to recommend. This book includes all the things that make up a good mystery – clues, ever changing suspects, a surprise ending … but also is set at summer camp, including a food fight, a stolen mascot, camp “color war” games, and lots more. What more could you ask for in a mystery? When the blue team’s moose mascot goes missing, it is up to Milo to figure out who took it and why… and to get it back. The likely suspect, Tony from the red team, seems to have an alibi, but there are some things that Milo doesn’t know yet about Tony – that’s where his partner Jazz, who happens to be at the girls camp across the way, comes in. In the end, the two of them put all the pieces together to solve the mystery. Kids will really like these easy to solve mysteries and will really enjoy “Super Sleuthing Strategies” at the end of the book. This series is one that I will be recommending for those early mystery readers.